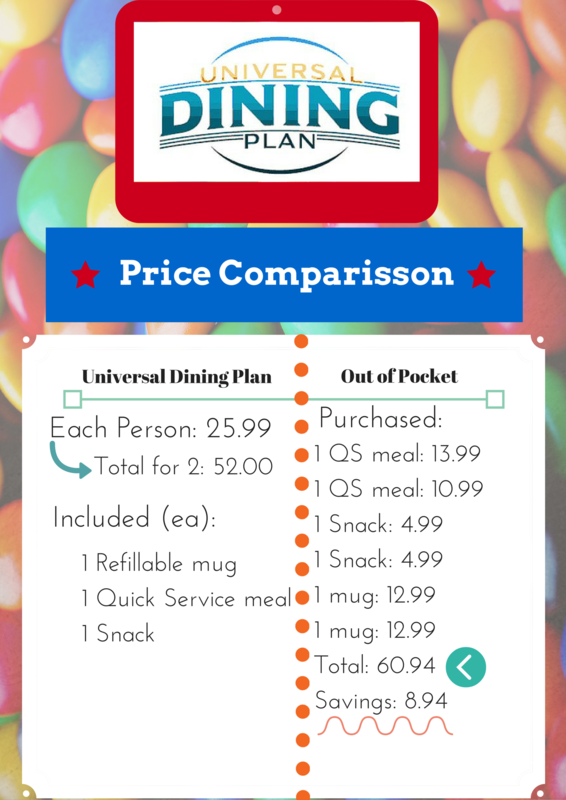 Universal offers several dining plans. I have an image below showing the description from their website. They offer only one that requires a resort reservation, all the rest can be purchased for ‘day visitors.’ This means that anyone visiting the resort from any hotel/home/etc.. can buy most of their dining plans! This is super cool and exciting. Disney does not offer this. To buy any of their dining plans, you MUST be staying on property. In fact the dining plan I used was the ‘best value’ plan and I came in from my home in Tampa, FL for a day visit; hence, I was definitely not staying on property. If it were me, I would always go with the best value plan. I feel it’s the best value for money. In this plan, you automatically get the coke freestyle mug and a meal/snack combo. If you think about that, the freestyle mug itself is 12.99, so that makes this deal a pretty darn good one. I must say those freestyle mugs are awesome when you’re doing the parks all day. You can refill them anywhere there is a freestyle machine and the refills are limitless for that one day. When you are used to paying 5.00 per powerade, this quickly pays for itself. To boot, you get to keep the mug as a souvenir and it’s a pretty nice mug at that. Keep in mind that the plans available in the red box (those available to everyone) only include quickservice meals. This really isn’t a problem in Universal Studios. There are tons of quickservice restaurants to choose from and they have great food. However, if you want a plan that will cover table service meals, you are limited to the one plan only available to resort guests. If you’re not a big drinker, you can certainly pick the cheaper plan for 19.99; just keep in mind that this will give you one drink as opposed to refills through the day for free. When you think about how hot the parks are and how thirsty you get, it seems that the plan with the mug is the way to go! Pricing – does it save you money? In a word, yes! You can see my breakdown of prices above. We paid 25.99 each for these plans. For this, we got two mugs (which we refilled about 6 times that day), two meals at the leaky cauldron in diagon alley, and two snacks (one at monsters café and one at Lard Lad donuts). I researched the actual prices for the meals we received and in total we saved around 8 dollars by buying the plan. This may not sound like much, but it is 8 dollars saved. Here’s another thing to consider, I didn’t order to the most expensive item on the menu at lunch. I chose a chicken sandwhich. It’s the cheapest item on the menu. Had I ordered a more expensive entrée, I would’ve saved even more money. With the dining plan, it doesn’t matter how much the entrees are, if they are at a participating restaurant, they are covered. How do you buy the plans? I bought mine on the phone from universal’s customer service. I then picked up the vouchers at will call and took them to the first restaurant we visited. They then trade the vouchers for plastic cards that you will give to the cashier wherever you purchase your next food item. Simple as that! The table below is going to compare and contrast the dinging plans at Disney and Universal! Ease of Purchase Universal’s plan can be purchased online or over the phone and is available to resort and non resort guests alike. Disney’s plan can only be purchased with a magic my way package and only if staying on Disney property. 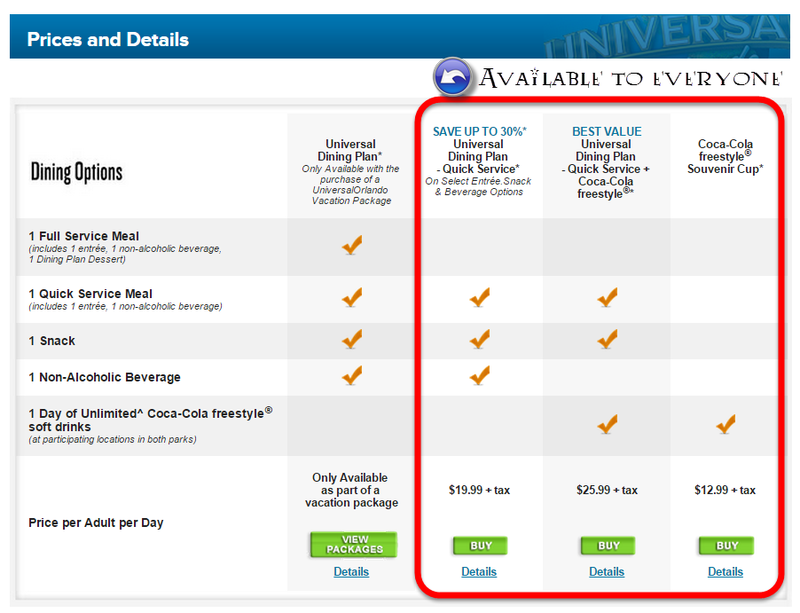 Availability Universal offers three plans to non-resort guests which is awesome since many park visitors stay off property. Disney’s can only be purchased if staying in select Disney resorts or DVC villas. Value Universal is very close on this one. You definitely save money with their plan as well, even though they don’t offer free dining. I must say Disney wins here because their plans apply to all resort and park restaurants PLUS if you buy during free dining week, it’s a heck of a deal! Ease of use You pick up vouchers at the gate for your plan and then trade them in for cards with the cashier. You need to keep track of your credits in your head or by looking at receipts. You must also keep track of your dining card. Your dining plan is linked to your magic band. Every server at Disney will let ask you if you participate before you order. All they have to do is scan your band after you eat. That’s it! You can look at your receipt to check your credits remaining. It’s a lot harder to lose your magic band than the card at Universal. Seamlessness The dining plan at universal is a bit new so it can be a little clunky. It can be difficult to figure out exactly what’s included and where you can eat at times. Not every restaurant at universal is included in your plan. At Disney, they have the dining plan down to a science. Almost all restaurants are included in your plan so all you have to do is designate between table service and quick service. The credits take a learning curve but are easy once you get the hang of it. Beverages The unlimited refills in the park with the freestyle mug is a deal and a half! The machines are well spread out in the park and have tons of options for thirsty park goers. Disney does give you unlimited refill mugs for the resort as part of the dining plan but can only be refilled at the resort. Considering you’re spending all day in the parks, that doesn’t help much when you’re thirsty at the Magic Kingdom. Quality of Food As I mentioned in the column to the right, universal wins here for quick service selection and quality. Disney has great food selections. I’d say the table service is top notch but sometimes the quick service needs improvement. As far as quick service, Universal wins. Food Selection Universal has way more selection for quick service restaurants and they tend to be a bit nicer. Almost all of them are indoor and airconditioned. At Disney, It can be tough to find a nice, air-conditioned quick service restaurant. For this reason, we typically make table service reservations. I highly recommend buying the Best value plan and at the very least taking advantage of the freestyle mug. The plans are so easy to buy that I would do this over and over again. I’m such a saver that I would continue doing it even if it saved me 2 dollars! Just think about what you can get for 8 dollars in the park! That gets you a really cool snack or a souvenir!